Introduced in 2011, the Aventador is Lamborghini’s current top of range model. It has a base price of just under $400k US, and as of 2016, 5,000 units were sold. It took the Murcielago 9 years to sell 4,100. The Roadster was introduced in 2013, and accounts for just under 1,500 of those 5k sales. Its V-12 engine was an all-new design that was good for 690hp and 508 lb-ft of torque. The model comes from AUTOart’s Signature line, meaning it has a higher parts count than a standard Millenium model. It also means it has a higher price. Roadsters are now $200+, but you can still get the 700-4 coupes and Aventador Js for a little bit less. Plus, these models are diecast unlike the new SVs, which are composite. 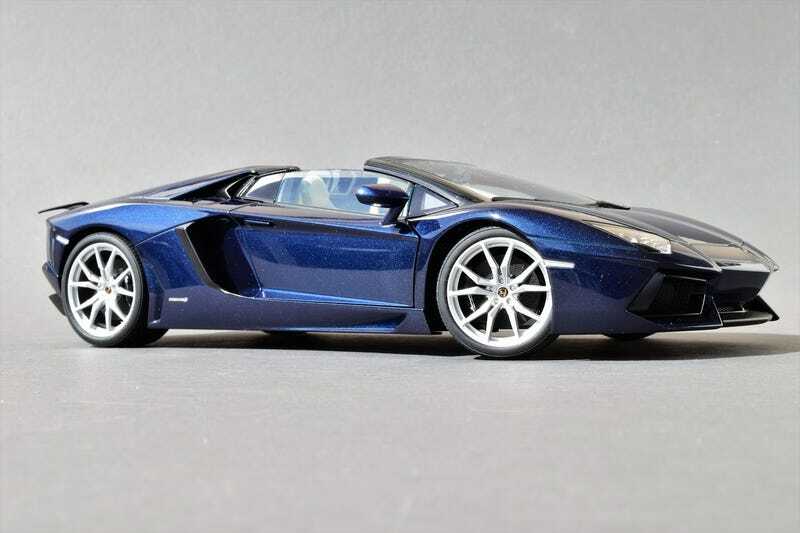 I’m curious as to how the composite model would compare, but I think my Aventador coupe fix will be met by either the Welly FX or Kyosho Ouisa models.